Google announced a few weeks ago that the Chrome web browser would start marking sites that don’t support HTTPS as “insecure”, leveraging its web browser market share to improve web security standards. Soon after, Mozilla jumped on board and indicated it would do the same with the Firefox browser. What does this mean for print and for you? 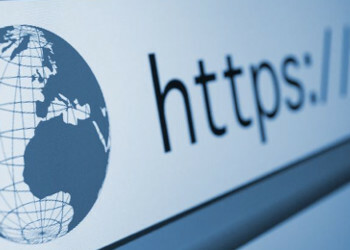 Go to your computer, open your favorite web browser, and try entering in HTTPS:// in front of your company website URL instead of the standard HTTP:// If you get a message about an Insecure Connection, then your site is not secured by what’s called an SSL (Secure Sockets Layer) certificate. The same goes if it’s blocked and won’t load at all. Without going too much into the technicalities, think of an SSL certificate as a letter from a close business associate endorsing you and your business as authentic. This is what an SSL certificate issuer does for your website. They verify it is where you say it is, that you own it, and then when a potential customer visits your site, tells them that your website is authentic and your web server isn’t trying to steal information. All of this goes on under the hood of your web browser without you having to do anything as a business owner…except have the certificate. Pretty neat huh? So why didn’t this come up before? Back in the early web, most data online was public text and images. HTTP actually stands for Hyper Text Transfer Protocol, and for the early web this was fine. However as eCommerce began to evolve, and people began to understand how the internet could be used in business transactions, attempts to steal information and defraud users became more sophisticated. The most classic of these is the so called “man in the middle attack”. Without a way to verify a website resides at a particular server, there’s nothing to stop a third party from pretending to host your website and get information submitted to it by users. Moreover, information intercepted in by an attacker can be sent on to your site in such a way that you think it originated from the legitimate user. Thus neither you nor your customer would know there was a “man in the middle”, passing information back and forth completely undetected. The solution to this is the SSL certificate, which allows encrypted traffic in the form of the encrypted version of HTTP, HTTPS (HTTPS Secure or HTTP over SSL), and introduces a third party certifier into your internet transactions. Prior to this week, HTTPS was considered optional and really only a necessity for those sites accepting credit card payments over the internet or offering browser-based email access (also known as webmail). As of the end of January, however, SSL has more or less become a practical requirement. If your site doesn’t have an SSL certificate installed, your customers will start seeing “INSECURE SITE” notifications in their Chrome and Firefox browsers, and may think twice about sending work your way, especially if the data being sent is sensitive and has any liability attached to it. Be smart: reach out to your IT vendor and get this going today. As far as the costs, that’s mostly for you and your IT vendor to work out. SSL certificates typically cost $50 to $100 dollars and have to be renewed annually. GoDaddy can set you up. However there’s also a free service called Let’s Encrypt which issues SSL certificates, but you may need to have the proper environment for this to be practical. It’s best to stay ahead of these changes. Google already announced last year that it would begin degrading websites that don’t support HTTPS in their search results. With this latest announcement, they’re changing the web, and making it more secure. When you think about it, this is a historic moment in the life of the internet. About the author: Charles Groce is the CEO of Pearl Street Consulting, a Michigan-based IT, web, and software consultancy. Charles is also the founder of osforprint.com, an open source technology solutions provider for the printing industry. You may not have noticed, but March 2014 was a turning point in the history of content consumption and distribution. This was month in which mobile usage overtook desktop usage, the so called “mobile tipping point”. Two yeasr later, mobile continues to climb, with an estimated 1.9 billion global users of mobile devices compared to 1.7 billion desktop users. This was a tipping point for publishing too, as content distributors needed to stop considering whether they should promote content over mobile and needed to start actually doing it. Flip books, also known as eBooks or eZines, are a popular piece of software for the printing industry due to its ability to publish online quickly and without distruption to the well established print workflow. If you’re a publisher, you know the drill. Files come in, a PDF is put together, plates are made, and the job is printed. Then comes the part where the eZine is created. All your prepress tech has to do is upload the PDF to an eZine publishing platform and your magazine or other publication is online in 15 minutes. It is certainly an axiom of publishing to make the consumption of content as convenient as possible for the reader. This is why we see billboards on our way to work, and not out in the middle of nowhere on some billboard farm. Effectively content delivery over mobile requires a publisher consider the inescapable fact that mobile devices are small, and mobile screens have a limited number of pixels on which to display content. This means, while distributing textual and graphic information, content needs to be displayed more or less in a single column format, easily scrollable using only the reader’s thumb. No zooming or playing around with the interface should be required, since the mobile user may simply leave and find somewhere more convenient to consume this type of content, or they may simply not consume the content at all and move on to something else. This is why flip books are poison for content being delivered over mobile devices. Flip books are laid out like a book or a magazine, which means in the abstract sense, content is already being distributed using a two column format (left page and right page). But then within each page, there are often multiple columns and complex layouts to convey information. These layouts are beautiful and part of the art of ink on paper. But they are an inconvenience for the mobile content consumer, who has to zoom and and move around the flip book to consume the content. This is fine if you’re distributing a public annual report over the internet to a board of directors, but for any consumer you’re trying to convince to buy something, or prospective student you’re trying to encourage to sign up for a college program, the inconvenience of the format may run them off. Before addressing the alternatives, let’s go over some of the statistics that show just how important the mobile internet is today to content distributors. According to the Pew Research Center, as of October 2014, 91% of Americans have a smart phone. 63% of Americans who own a mobile use their mobile phone to browse the internet, which means 57% of Americans are mobile internet users. This number has doubled since 2009. 34% of mobile internet users use their phone as their primary internet device. This proportion is larger for the younger demographics, meaning that this proportion is guaranteed to continue to grow well into the future. Publishers who ignore these figures do so at their own peril. We simply cannot ignore the implications for our industry. So now the question becomes: how do we get publication content online in such as a way as to effectively deliver content without adding much overhead to our established print-centric workflow? Flip books are not the answer, for the reasons outlined above. Although flip books do allow publishers to get content online easily and cheaply, their format for mobile web users discourages engagement with whatever call to action is being presented. If you’re a printer, at best, you can hope your customers who are publishers do not understand this deficiency of the flip book format and are satisfied with the limited but nevertheless online and accessible everywhere flip book. But this doesn’t mean being a good partner. You should be providing solutions to problems, and should demonstrate your understanding of your customers end goals. Publishers who want to put content online shoudl adopt a “content first/delivery channel neutral” online strategy. This means using a modern content management system, or CMS, which is used to store content in an online database and is designed to distribute content attractively to devices of any size: smart phone, net books, tablets, laptops, and large screen desktops. When a potential customer arrives at your site with their smart phone, the content is delivered in single column format. Later when they show their friends this great new product on their laptop, the content is delivered in multi column format. This is called “responsive design”. Online marketing content that is delivered responsively see, one study has shown, 35% more engagement to the call to action than online marketing content which is not formatted for all devices. What you’re seeing is these figures are the problems of mobile content delivery I’ve described above. Web sites can suffer from the same formatting issues inherent in flip books. 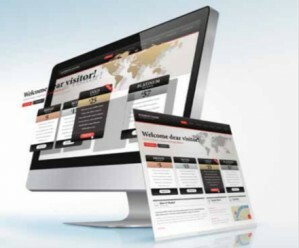 Responsive, device-conscious onlin content delivery methods are a market differentiator, and this means the eventual end of flip books and non-responsive websites alike. About the author: Charles Groce is the CEO of Pearl Street Consulting, a Michigan-based IT, web, and software consultancy. Charles is also the owner/operator osforprint.com, an open source technology solutions provider for the printing industry. A few years back I had the opportunity to evaluate various “web-to-print” solutions (or W2P) from several of the leading software vendors. Although all of the W2P systems evaluated technically did what they were supposed to do, there were some drawbacks which ultimately prevented our commercial printing company from moving forward on the decision to sell print (efficiently) online. The largest of these, of course, was cost, including deployment, licensing, hosting, and support. The cost of these systems and the connection to a guaranteed benefit on the bottom line was simply not clear. It was a difficult decision: sink tens of thousands of dollars into licensing for an MIS-integrated web-to-print portal, with at least eventual “hands free” order placement to plate-making capabilities; or do it the old fashion way, and use our website as corporate “brochureware”, and have staff inserted at every touchpoint in the production process, from design through billing. That was 2009 and a lot has happened in the industry since then. Today, in 2016, every printing company needs to be able to satisfy the needs of the “modern shopper”. Like it or not, Amazon and other eCommerce providers have changed the way people think about how they shop, and this applies to print buyers as well. Consumers want to be able to make their own (informed) decisions and have different expectations than they used to have. As web entrepreneurs, our job is to not only give them the tools to actually place their order but also give them the information needed to make an informed decision, albeit with information that provides a marketing influence that “leans” in our direction. Think of your web-to-print portal as a salesperson not drawing a salary or commission. It’s not for every customer, but it will be appealing to some. Moreover, a web-to-print portal can be branded differently than your company. And if you base your web-to-print portal on open source software, you can avoid additional licensing costs to duplicate it under your corporate identity or under as many brands as you want. This allows you to sell print online not only to a general audience, i.e. 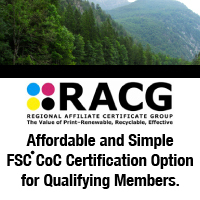 everyone, with a general one-size-fits-all marketing message along the lines of “we’re your trusted partner”, but to tailor to specific markets: academic, religious, manufacturing, governmental, etc., without significant overhead since there aren’t additional licensing costs and the code can simply be copied to a new web portal. 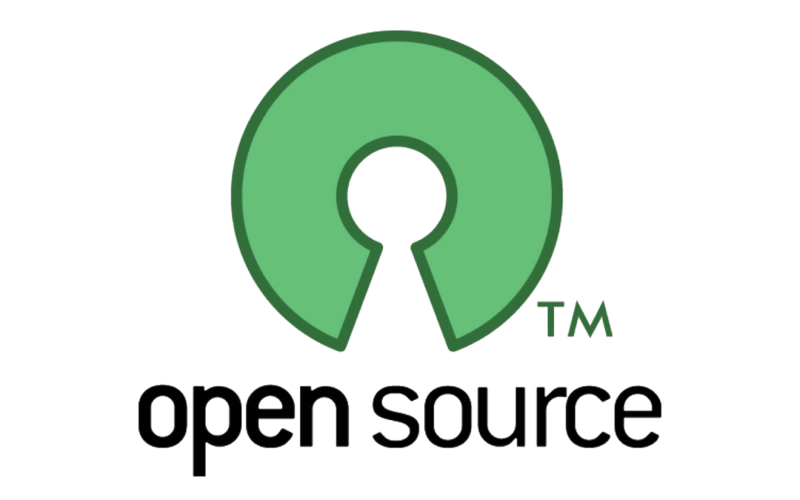 What is the current state of open source web-to-print? This is a very large topic. I’m not in a position to evaluate every solution that arises in this continuously evolving software landscape, but I thought it might be useful to summare a couple of the leading web-to-print products and website plugins that the major open source platforms. None of these are going to integrate with your print MIS system right out-of-the-box, although all of them will integrate with well-established accounting systems like Quickbooks. This doesn’t mean you shouldn’t weigh the benefits of such systems. Two popular open source eCommerce platforms I’m going to write about are WordPress (Woocommerce) and Magento, which is owned by a subsidiary of eBay (eBay bought the company behind Magento in 2010, seeing a rising competitive threat from open source eCommerce). So I’m going to restrict my list to these platforms, and I’ll write a little bit about the pros and cons of each over the other. Both platforms are, of course, open source and come with zero dollars in licensing fees. 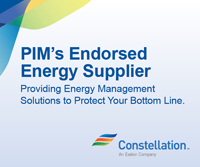 Each platform could be downloaded, installed, and customer-facing today for free. Woocommerce is perfect if your shop doesn’t contain a large number of products, and requires a great presentation. I like to think of WordPress as the platform that’s perfect for web designers. It’s well suited to web designers because the platform is easy to update in terms of its theme and design. Magento on the other hand is, in my opinion, the better platform for eCommerce shops with large numbers of products and product categories. Magento is written by using a more complicated web framework called MVC (Model-Viewer-Controller) and can be more difficult for non-technical personnel to get their head around. This is why it lags a bit in the design department, although the trade off over WordPress/Woocommerce are significant productivity enhancements (like automated emails, integrated newsletter management and a more flexible framework for extensibility). Both platforms have multiple APIs (Application Programming Interfaces), and can be integrated with just about anything, including your MIS. In short, my recommendation is for Woocommerce if you don’t have a large number of products or product configurations (don’t confuse this with run quantity) and Magento if you have a large number of product or product configurations. Now on to some examples of the leading web-to-print solutions available on each platform. Just to clarify, web-to- print solutions are a subset of digital storefront solutions (DSF). DSF is really just another name for eCommerce, something the open source community mastered long ago (with respect to the short history of the internet). “Web-to-print” differs from standard DSF in that it allows for real-time product previews and at least has the capability for some amount of automation through API access. I’m going to restrict my list to the ordering process, including real time previewing. uDraw is a powerful, easy-to-use web-to-print plugin that runs under WordPress/Woocommerce using a modern HTML5 framework (no Java plugins or Flash to deal with). It supports a PDF workflow and allows for in-browser real time editing and uploading. Your users can create brochures (with folding), business cards, mousepads, personalized bags, and more right from within the web browser. It’s mobile friendly and allows for the building of custom products. The ordering processing products are a layered PDF file that can be tweaked by your prepress as needed. WordPress/Woocommerce are both, of course, free to use. uDraw requires a $500 setup fee and costs around $99/month for a subscription to the service. There is a free version of the plugin available so you can test it out (even do a little market testing). Give it a try by visiting the URL http://bit.ly/1M21chu. PrintScience is a fantastic plugin that integrates with the Magento platform. Templates are created using Adobe Acrobat Pro and the PDFLib plugin, allowing VDP fields to be inserted directly into your PDF. In additional to the standard features listed above with uDraw, PrintScience allows your customers to download realtime generated PDF previews of their templates (with watermarking). There are many other options for open source, including ZetaPrints which runs on Magento, but utilizes Corel Draw (you read that right) for templating which starts at $1.70 per order, and a nice solution called“DesignnBuy”which also runs on Magento that starts at around $7000, far less than the price tag on many of the “industry standard” solutions. That these solutions run on open source platforms means they have the added advantage of being highly flexible and integrable with other platforms, such as MIS platforms, prepress systems, and more. Whichever platform you decide to go with, definitely start selling print online if you’re not already doing it. Appealing to modern shopping expectations is sure to increasingly become a market differentiator between the old schools and the new schools of print. 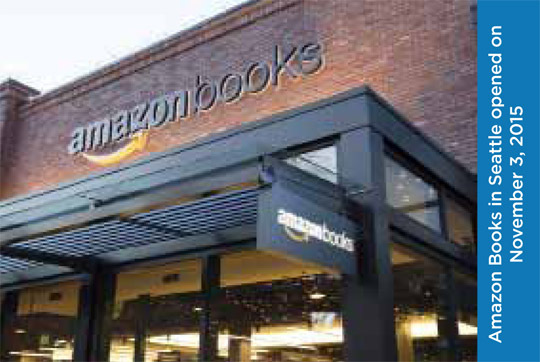 Last November Amazon opened its first retail book store in Seattle near the campus of the University of Washington. More than two decades after it pioneered online book sales—and initiated the e-commerce disruption of the retail industry— the $550 billion company seemed to be taking a step backward with its “brick and mortar” Amazon Books. However, Amazon launched its store concept with a nod to traditional consumer shopping habits, i.e. the ability to “kick the tires.” Amazon knows very well that many customers like to browse the shelves in bookstores and fiddle with electronic gadgets like the Kindle, Fire TV and Echo before they make buying decisions. So far, the Seattle book store has been successful and Amazon has plans to open more locations. Some unique features of the Amazon.com buying experience have been extended to the book store. Customer star ratings and reviews are posted near book displays; shoppers are encouraged to use the Amazon app and scan bar codes to check prices. Amazon’s book store initiative was also possibly motivated by the persistence and strength of the print book market. Despite the rapid rise of e-books, print books have shown a resurgence of late. Following a sales decline of 15 million print books in 2013 to just above 500 million units, the past two years have seen an increase to 560 million in 2014 and 570 million in 2015. Meanwhile, the American Booksellers Association reported a substantial increase in independent bookstores over the past five years (1,712 member stores in 2,227 locations in 2015, up from 1,410 in 1,660 locations in 2010). The ratio of e-book to print book sales appears to have leveled off at around 1 to 3. This relationship supports recent public perception surveys and learning studies that show the reading experience and information retention properties of print books are superior to that of e-books. The reasons for the recent uptick in print sales and the slowing of e-book expansion are complex. Changes in the overall economy, adjustments to bookstore inventory from digital print technologies and the acclimation of consumers to the differences between the two media platforms have created a dynamic and rapidly shifting landscape. As many analysts have insisted, it is difficult to make any hard and fast predictions about future trends of either segment of the book market. However, two things are clear: (1) the printed book will undergo little further evolution and (2) the e-book is headed for rapid and dramatic innovation. Amazon launched the e-book revolution in 2007 with the first Kindle device. Although digital books were previously available in various computer file formats and media types like CD-ROMs for decades, e-books connected with Amazon’s Kindle took off in popularity beginning in 2008. The most important technical innovation of the Kindle—and a major factor in its success— was the implementation of the e-paper display. Distinct from backlit LCD displays on most mobile devices and personal computers, e-paper displays are designed to mimic the appearance of ink on paper. Another important difference is that the energy requirements of e-paper devices are significantly lower than LCD-based systems. Even in later models that offer automatic back lighting for low-light reading conditions, e-paper devices will run for weeks on a single charge while most LCD systems require a recharge in less than 24-hours. The theory behind the Kindle’s ink-on-paper emulation was originated in the 1970s at the Xerox Palo Alto Research Center in California by Nick Sheridon. Sheridon developed his concepts while working to overcome limitations with the displays of the Xerox Alto, the first desktop computer. The early monitors could only be viewed in darkened office environments because of insufficient brightness and contrast. Sheridon sought to develop a display that could match the contrast and readability of black ink on white paper. Along with his team of engineers at Xerox, Sheridon developed Gyricon, a substrate with thousands of microscopic plastic beads—each of which were half black and half white—suspended in a thin and transparent silicon sheet. Changes in voltage polarity caused either the white or black side of the beads to rotate up and display images and text without backlighting or special ambient light conditions. In 2000, Gyricon LLC was founded as a subsidiary of Xerox to develop commercially viable e-paper products. 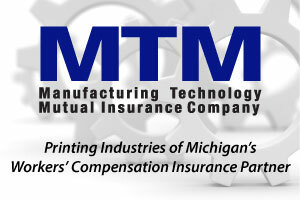 The startup opened manufacturing facilities in Ann Arbor, Michigan and developed several products including e-signage that utilized Wi-Fi networking to remotely update messaging. Unfortunately, Xerox shut down the entity in 2005 due to financial problems. By the 1990s competitors began entering the e-paper market. E Ink, founded in 1998 by a group of scientists and engineers from MIT’s Media Lab including Russ Wilcox, developed a concept similar to Sheridon’s. Instead of using rotating beads with white and black hemispheres, E Ink introduced a method of suspending microencapsulated cells filled with both black and white particles in a thin transparent film. Electrical charges to the film caused the black or white particles to rise to the top of the microcapsules and create the appearance of a printed page. E Ink’s e-paper technology was initially implemented by Sony in 2004 in the first commercially available e-reader called LIBRIe. In 2006, Motorola integrated an E Ink display in its F3 cellular phone. A year later, Amazon included E Ink’s 6-inch display in the first Amazon Kindle which became by far the most popular device of its kind. Subsequent generations of Kindle devices have integrated E Ink displays with progressively improved contrast, resolution and energy consumption. By 2011, the third generation Kindle included touch screen capability (the original Kindle had an integrated hardware keyboard for input). The current edition of the Kindle Paperwhite (3rd Generation) combines back lighting and a touch interface with E Ink Carta technology and a resolution of 300 pixels per inch. Many other e-readers such as the Barnes & Noble Nook, the Kobo, the Onyx Boox and the PocketBook also use E Ink products for their displays. The quest to replicate, as closely as possible in electronic form, the appearance of ink on paper is logical enough. In the absence of a practical and culturally established form, the new media naturally strives to emulate that which came before it. This process is reminiscent of the evolution of the first printed books. For many decades, print carried over the characteristics of the books that were hand-copied by scribes. It is well-known that Gutenberg’s “mechanized handwriting” invention (1440-50) sought to imitate the best works of the Medieval monks. The Gutenberg Bible, for instance, has two columns of print text while everything else about the volume —paper, size, ornamental drop caps, illustrations, gold leaf accents, binding, etc.—required techniques that preceded the invention of printing. Thus, the initial impact of Gutenberg’s system was an increase in the productivity of book duplication and the displacement of scribes; it would take some time for the implications of the new process to work its way through the function, form and content of books. More than a half century later—following the spread of Gutenberg’s invention to the rest of Europe—the book began to evolve dramatically and take on attributes specific to printing and other changes taking place in society. For example, by the first decade of the 1500s, books were no longer stationary objects to be read in exclusive libraries and reading rooms of the privileged few. As their cost dropped, editions became more plentiful and literacy expanded, books were being read everywhere and by everybody. By the middle 1500s, both the form and content of books became transformed. To facilitate their newfound portability, the size of books fell from the folio (14.5” x 20”) to the octavo the octavo dimension (7”x 10.5”). By the beginning of the next century, popular literature—the first European novel is widely recognized as Cervantes’ Don Quixote of 1605—supplanted verse and classic texts. New forms of print media developed such as chapbooks, broadsheets and newspapers. It seems clear that the dominance of LCD displays on computers, mobile and handheld devices is a factor in the persistent affinity of the public for print books. Much of the technology investment and advancement of the past decade—coming from companies such as Apple Computer—has been committed to computer miniaturization and mobility, not the transition from print to electronic media. While first decade e-readers have made important strides, most e-books are still being read on devices that are visually distant from print books, impeding a more substantial migration to the new media. Additionally, most current e-paper devices have many unpaper like characteristics such as relatively small size, inflexibility, limited bit-depth and the inability to write on them. All current model e-paper Kindles, for example, are limited to 6-inch displays with 16 grey levels beneath a heavy and fragile layer of glass and no support for handwriting. 13.3” format, flexible and supports stylus handwriting (pictured right). A new generation of e-paper systems is now being developed that overcome many of these limitations. In 2014, Sony released its Digital Paper System (DPT- S1) that is a letter-size e-reader and e-notebook (for $1,100 at launch and currently selling for $799). The DPT-S1 is based on E Ink’s Mobius display, a 13.3” thin film transistor (TFT) platform that is flexible and can accept handwriting from a stylus. Since it does not have any glass, the new Sony device weighs 12.6 oz or about half of a similar LCD-based tablet. With the addition of stylus-based handwriting capability, the device functions like an electronic notepad and, meanwhile, notes can be written in the margins of e-books and other electronic documents. These advancements and others show that e-paper is positioned for a renewed surge into things that have yet to be conceived. Once a flat surface can be curved or even folded and then made to transform itself into any image—including a color image—at any time and at very low cost and very low energy consumption, then many things are possible like e-wall paper, e-wrapping paper, e-milk cartons and e-price tags. The possibilities are enormous. Most companies in the printing industry by now have at least gone through the experience of deploying some kind of CRM, or Customer Relationship Management system, but I dare say few printing companies have done so successfully. The most difficult aspect of successfully deploying a CRM lies not in the technical aspects of deployment. Have no doubt that with enough money thrown at a CRM project it will, in the end, more or less do what it’s supposed to do: archive customer data, “automate” sales and marketing processes, and systematize all sorts of organizational communications. That all sounds great, but the problem with successful company adoption of CRM lies, in the end, with the people that are expected to use the system: your staff. First, let’s define CRM. CRM stands for Customer Relationship Management and is a software system which allows your company to effectively organize all sorts of data, including customer data, lead data, sales activity, and more. Think of your CRM as your information repository of all data related to your customers and potential customers. It is like an online library of all important communications with your customers and potential customers. Some time after a successful deployment and adoption of a CRM at your organization, any member of your staff will be able to use the system to review the history of your company’s interaction with any customer, from the initial winning of the customer, to looking at job activity and performance, to the systematic and proactive review of production or fulfillment problems which arose in the past with each customer. Print is certainly not alone with regards to the challenges of successful CRM adoption. In a 2013 study by the marketing agency Merkle Group Inc, interviews of 352 senior-level executives at companies with $1+ billion in revenue revealed that an astounding two-thirds (63%) saw CRM deployment at their companies as a failure. The reasons cited by the report may sound familiar to companies in print who’ve had difficulties with CRM. They include a lack of clear ownership of customer insight data (training and information workflow, 53%), lopsided adoption by department management (43%), a lack of executive buy-in (38%), and CRM not being a priority with company IT (38%). Does this mean that CRM deployment is a waste of time and resources? Not at all! The same study showed that high growth organizations, those companies with both revenue growth and profit growth, were 50% more likely than low-growth organizations to view CRM as key to their company’s success. So CRM is important to the bottom line, and this begs the question: How can organizations in print deploy a CRM successfully? In this article, I want to briefly list some of the factors that I’ve seen in the successful adoption of CRM solutions in the printing industry as well as some of the barriers to adoption. Successful adoption requires, absolutely must include executive and managerial buy-in. Owners must insist that their managers require their staff to utilize the CRM in their day-to-day reporting activities. This means, of course, that staff must be trained on the daily usage of the system and must be continually reminded of its value. A customer has a problem? It shouldn’t be put down on a paper form which goes in a dark desk drawer where it dies a slow, biodegradeable death. This information goes in the CRM where it will be reviewed later as part of a CRM-driven job follow-up process. A potential customer has called in and asked for more information? This touch point goes in the CRM where all such activity can be analyzed later. A special postal form is required for a customer mailing on their own periodical permit: all pertinent information goes in the CRM, not on some sticky note attached to a CSR’s computer monitor. The CRM as the central repository of your customer interaction data becomes the most critical system in your organization allowing your company to be systematic in its interactions with customers. Managers must insist that members of their team stop utilizing their own way of organizing this data, even if this approach has worked for years, but utilize a CRM to make customer-specific information systematically organized and widely available to the team. This is admittedly easier said that done. Managers can demand all they want that staff use the CRM system, but if the staff sees it merely as a reporting tool, it’s less likely to be adopted enthusiastically. This is why it’s critical that organizations integrate the CRM with their main MIS (Management Information) system. The CRM should also be the most convenient place where your sales and customer service staff retrieves quotes, invoices, and other customer specific data. But isn’t this the purpose of your MIS? It’s part of it, but MIS systems often don’t provide the flexibility of a modern CRM, with their automated email capabilities, task assignment, mobile integration, and powerful built-in visualization tools. Print specific MIS systems are great at what they’re designed to do, operate your printing business, but not great at what they’re not designed to do. CRM functions are often, at best, an after thought in the design of print-specific MIS systems. Finally, in choosing a CRM for your company, we argue that successful deployment and adoption is not so much about choosing the right system as it is about successfully preparing your staff for the cultural change that comes from putting a CRM front and center in your operation. CRM adoption ain’t easy, but it can be done with a well thought out approach that isn’t simply driven by the technical requirements. Successful CRM adoption requires a one-two punch of adoption from the top down. 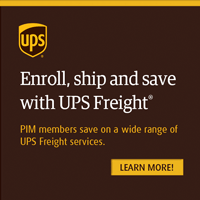 PIM members should contact the PIM office for more information 248.946.5895. 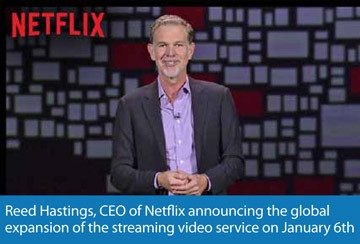 Prior to this latest announcement, Netflix had 40 million subscribers in the US and 20 million subscribers internationally in a total of 60 countries and available in 17 languages. According to Hastings, the company’s goal is to reach 200 countries by the end of 2016 and sign up 90 million US and 450 million worldwide subscribers. The rapid expansion of Netflix is part of the transformation of TV program and movie viewing that has been underway for a decade or more. While “linear TV”— programming that is presented at specific times and on non-portable screens—is still popular, it is being rapidly overtaken by the new personalized, on-demand and mobile subscription services like Netflix. According to Netflix, the growth of Internet TV is driven by (1) advancements in Internet reliability and performance, (2) time and place flexibility of on-demand viewing and (3) accelerating innovation of streaming video technology. A possible fourth driver of Netflix’s success is its subscription-based user model. Unlike previous on-demand solutions that often required consumers to purchase one at a time—or rent for a specified period of time—their own copies of movies and music, streaming media solutions like Netflix offers subscribers access to their entire content library without limitations for a monthly fee. Streaming media refers to video or audio content that is transmitted in a compressed digital form over the Internet and played immediately, rather than being downloaded onto a computer hard drive or other storage media for later playback. Therefore, users do not need to wait for the entire media file to be sent before playing it; the media file is delivered in a continuous stream and can be watched or listened to as soon as the playing process is able to begin. Attempts in the 1990s by Microsoft (Windows Media Player), Apple (QuickTime) and RealNetworks (RealPlayer) to develop streaming technologies on desktop computers made important breakthroughs. However, each of these solutions required proprietary file formats and media players that resulted in an unworkable system for users. By the early 2000s, the adoption of broadband internet and improvements in CPU and data throughput along with efforts to create a single, unified format led to the adoption of Adobe Flash as a de facto standard for streaming media. By 2005, when the social media and video sharing service YouTube was established, Flash became the dominant streaming technology on the Internet. More recently—especially since 2011—HTML5 has advanced as an international standard on computers and mobile devices and it will eventually supplant Flash. Streaming media has been transforming the music industry along side of TV and movies. While digital downloads still represent the largest percentage of music sales in the US, they are falling. Meanwhile, streaming music services like Pandora, Spotify and Apple Music have already overtaken physical CD sales and represent about one third of the industry’s income. Some analysts expect revenue from music streaming to surpass that of digital downloads in the near future. Streaming media has fundamentally shifted the relationship between consumers and entertainment content. During the era of broadcast radio (1920s) and television (1950s), consumers needed a “set” to receive the analog programs of radio stations and TV channels. Meanwhile, audience members had to be in front of their radio or TV—with “rabbit ears” antenna adjusted optimally—on a schedule set by the broadcasters. The cost of programming was paid for by commercial advertising and corporate sponsors. In the cable and satellite era (1970s), consumers began paying for content with subscription fees and programming was “commercial free.” Along with home recording devices—at first analog magnetic tape systems like VCRs (1970s) and digital recording devices like DVRs (late 1990s)—came an important shift in viewing behavior. Consumers could do what is now called “time shifted viewing,” i.e. they could choose when they wanted to experience the recorded content. At first, music publishers mass produced and marketed analog audio recordings—records (1950s) and then audio tapes (1970s)—and consumers purchased and owned a library of recordings. These records and tapes could be enjoyed at any time and place as long as there was an audio system with a stereo turntable or cassette player available. The same was true of mass produced CD audio (1980s) and DVD video (2000s) optical discs. While these digital formats improved portability and their quality did not deteriorate from repeated play—the way that analog magnetic and vinyl did— they required a new generation of optical devices. Portable CD (1980s) and DVD players (late 1990s) addressed this issue, but consumers still had to maintain a library of purchased titles. With digital downloading of music and video over the Internet, content could finally be played anywhere and at anytime on portable digital players like iPods (2001) and notebook PCs. However, consumers were still required to purchase the titles they wanted to enjoy. Instead of owning bookshelves and cabinets full of CD and DVD jewel cases, downloaded electron- ic files had to be maintained on MP3 players, computer hard drives and digital media servers. When Internet-based media streaming arrived alongside of mobile and wireless computing the real potential of time and place independent content viewing became a reality. Add to these the subscription model—with (potentially) the entire back catalog of recorded music, TV shows and movies available for a relatively small monthly fee—and consumers began flocking in large numbers to services like Netflix and Spotify. The cord-cutting trend—households that are ending their cable TV service—is accelerating. Total households with cable subscriptions fell from 83% in 2014 to under 80% in 2015 [Pacific Crest]. Scheduled “linear” TV fell and recorded “linear” TV was flat (or even increased slightly) from 2014 to 2015, while streamed on-demand video increased [Ericsson ConsumerLab]. While streaming audio and video are growing rapidly, traditional radio and TV still represent by far the largest percentages of consumer activity. Obviously, some of the cultural and behavior changes involved in streaming media run up against audience demographics: some older consumers are less likely to shift their habits while some younger consumers have had fewer or no “linear” experiences. As the Ericsson ConsumerLab study shows, teenagers spend less than 20% of their TV viewing time watching a TV screen; the other 80% is spent in front of desktop and laptop computers, tablets and smartphones. Despite these differences, streaming content use is soaring and the era of “linear”media is rapidly coming to an end. Just like the relationship between eBooks and print books, the electronic alternative is expanding rapidly while the analog form persists and, in some ways, is stronger than ever. Nonetheless, the new era of time and place independent on-demand media is fast approaching.